Take the Abundance Bible Study Challenge for Financial Breakthrough! Do you need major financial breakthrough? If so, I have an AMAZING new Bible study challenge for you: the Abundance Bible Study Challenge! A few days ago, as I was praying for our Presence-seeking community and specifically for everyone’s finances, the Lord downloaded this Bible study challenge into my heart–and I instantly fell in love with it. I am so excited about it that I actually started it already, and it’s powerful! As you may know, a major part of receiving breakthrough in any area is REVELATION. Revelation from the Lord specifically about the subject in which you need breakthrough! And Holy Spirit is the only One who can give that kind of revelation. Revelation is experiential knowledge that comes alive in your heart, body, mind, soul, and spirit–and produces the manifestation of the thing in your life about which you have the revelation. 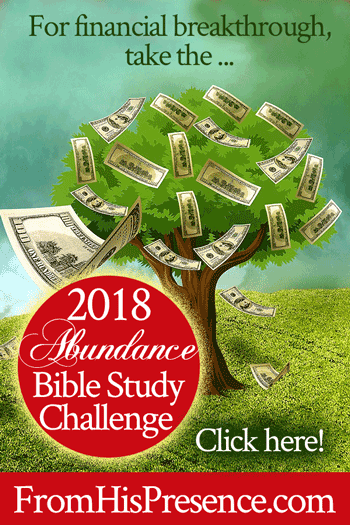 And the Lord showed me the Abundance Bible Study Challenge because it will help you get revelation–and it will provide Him a path down which He can personally walk with you, discipling you toward your financial rebirth! The Abundance Bible Study Challenge is a way for you and Holy Spirit to transform your finances together. Related: I taught live about the Abundance Challenge via Facebook video here, if you’d like to see how I set up my own Bible! 1. Decide on a Bible you will use specifically for this Bible study. It’s in my heart to use a totally different Bible than I usually use, so I can fill it up exclusively with notes from this Challenge. So, I am using a copy of the Large Print NKJV Journaling Bible that I referenced here in my 2017 Christmas Gift Guide for Presence Seekers. If you do not want to get a new Bible, that’s okay. Do the study using your current Bible anyway–but be sure to mark your assignments and notes clearly somehow (e.g. using a bright green highlighter, green pen, colored pencil, or something like that), so you can easily distinguish your notes on this Challenge from everything else in your Bible. 2. Study this Bible from cover to cover specifically regarding the subject of God’s abundance. What He says about money, including how money should be earned, spent, given, and managed in general. Basically, you are looking for anything the Bible says about God’s abundance; about how money works; and how God provides it. Fill your Bible with notes about abundance and provision. Highlight Scriptures and promises to pray about your finances. 3. Also, make an action journal and tape it inside your Bible. As you learn about our Papa’s abundance, Holy Spirit will lead you to take practical steps that will help you begin walking in that abundance. As He does, you will want to obey! Blessing comes from a combination of revelation and obedience! As you obey Him, it’s inspiring and motivating to keep record of what you’ve done. You might not think that one little step is important, but it is! And if you keep a record of your baby steps of obedience before your eyes, you will be inspired to keep going. You will also see how much your tiny steps make a difference over time. That’s how your action journal will help! It will keep you motivated! Maybe you are prompted to place $20 in a savings account. Do it, then write down the date and the action you took in your action journal/list! Maybe you take on an extra shift at work so you can get paid a little extra. Write down the date, and the fact that you worked an extra shift! Maybe you make an extra payment on your credit card. Write down the date and amount! Maybe you have a yard sale to help knock down those bills a little more. Write down what you did and how much you made! Action journals are more inspiring than crossing things off a list because you are accumulating actions, rather than eliminating them. Accumulating is always more motivating than getting rid of to-do items. 🙂 When you see one action on your list, you’ll be inspired to add another … and another … and another! 4. Keep a giving ledger on God! A giving ledger is a list of gifts you’ve sown into the Kingdom, what you sowed them for, how much you expect from God in return, and what He did with your gift! I love keeping a giving ledger; it builds my faith. My ledger shows Him that I expect Him to keep His Word–and so He always does! Remember that He who comes to God must believe that He exists, and that He is a rewarder of those who diligently seek Him (Hebrews 11:6). Related: Watch my Facebook video here about how to keep a giving ledger on God. I am taping my giving ledger for 2018 into my Abundance Challenge Bible, so I can keep track of it easily. I’d encourage you to do the same. 5. Make a net worth statement at the beginning of the year and at the close of every month, and watch Holy Spirit disciple you out of poverty. A net worth statement is simply a list of what you own versus what you owe. You subtract what you owe from what you own, and the result is your net worth. Most people’s net worth is a negative number. They owe more than they own. But it doesn’t have to be that way! Remember that God is an ABUNDANT God! He wants to bless you–and He will! You do have to do your homework, though. You must have both revelation and obedience. And part of obeying God in the area of finances is to be diligent to know the state of your flocks and herds–your accounts, assets, liabilities, etc. So make that net worth statement. It will help you understand your finances. It will inspire you to take action about your finances. It will let you see how the small steps you are taking make a difference each month. It will be a memorial to God, showing how He comes up under you to help you as you are diligent to be a good steward each month. So make those net worth statements and watch your finances change! 6. Make a harvestology map and sow strategically for the harvest you want. My husband and I sow into specific ministries who have great financial breakthrough, because we want the same thing. We sow into ministries who operate in signs and wonders, because we want the same thing. We sow into ministries who operate in the passion of our hearts, but who are years ahead of us, because we want the same thing. So we’re sending our seed ahead of us, knowing that it will bring us the return we desire. You need to do the same thing. You need to know WHAT you’re sowing for before you sow, and then sow the seed–in the place, and in the way–that will bring you that harvest. To do this, make a simple harvestology map! It’s a map of your garden seeds. However, instead of mapping out where you will plant tomatoes, beans, and sunflowers, you are mapping out where you will sow seed for revelation, spiritual growth, financial breakthrough, signs and wonders, a husband or wife, or anything else you desire from the Lord. Then, every time you sow a seed into one of those strategic places, write down the date and the amount of your seed. Pray over your seeds often, and you WILL see them come up with the harvest you desire! Just don’t forget about them! The Abundance Bible Study Challenge is a Bible study method that you can use to watch your finances change every single day. To help you, I am sharing the PDF files and worksheets that I made for my own Bible. You’re welcome to print these off. If the sizes below don’t work for you, just scale them in your browser’s print window so they fit inside your Bible. Financial breakthrough takes both revelation and participation. I believe you will see financial change. You will see breakthrough, because hiding God’s Word in your heart and obeying that word always brings breakthrough. Are you in on this challenge? Do you have any questions? Leave your comments below, and I’ll answer any questions I can! We’re in Jamie! Thank you!! I’m a rare one as I have a home and car both given by Papa. My home was inherited and Father touched the heart of a couple who purchased the vehicle. 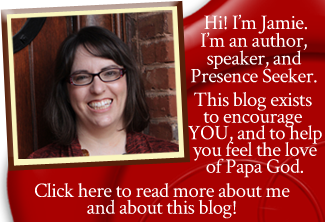 I have zero debt load other than standard monthly debts and a small business that Papa provides exactly what I need each month. Im doing the challenge to increase, as I’m never given more than I actually need. Thus leaving me no store house. I am truly thankful for His provision every day and I’m not clear as to the why but at times I feel as if I’m being ungrateful in asking for more. I have all my needs covered but my hearts desire is a different place, physically and financially. God bless you Sister. Is it almost baby time??? Awesome place to start! You are definitely not being ungrateful in asking for more. God’s Word says we should have way more than enough, so much that you should be lending even to nations! Can you imagine that? So don’t stop now! Go after all He has for you! I’m so excited! I want to do this, obey and learn. Thank you Jamie, for all your hard work on this!! Awesome! Glory to God! So glad to have you along! Thank you so much for this Jamie. A testimony. As God enabled me to get with a group of women provide the meal and trinkets. The number he spoke in my heart showed up. We gathered, prayed, and fellowship with one another. That same evening, (same day blessing)- someone provided groceries for me and my son. He is the God of goodness and abundance. I’m in! I am a novice concerning all things finances but I’m willing to learn because I believe being a good steward in my finances will unlock so many other gles st ings for my family and I. Thank you Jamie. Not only am I in, but each day of this journey, I will pray for your finances and the finances of all those who will join in this bible study challenge and I encourage everyone to do the same so our unity in prayer for one another will attract more blessings.Thank you for sharing all the wonderfull revelations the Lord is showing you. This is so exciting! This is a Bible study like none I’ve ever seen. This is so positive, building, energizing, and empowering — all signs that this is of the LORD because it builds up, it gives, it encourages, and it brings participants closer to GOD, especially by drawing them deeper into His Word. And the more we enter into the Heart of GOD, the more we will be enlightened and empowered to serve His people and fulfill the great commission to harvest souls for Heaven. I have to say it again: I’m EXCITED! YES! And this is my favorite comment ever! Yes – energizing and inspiring and empowering – that’s exactly what it’s supposed to be! Praise God! Holy Spirit is a POWERHOUSE and He’s giving us power too as we study and obey Him! Yes, I am in and ready to see FATHER GOD’S Abundant Harvest thriving in my life. Thank you Jamie. I am in! As a coordinator for Financial Peace University, I am looking for more ways to get more Word on this into me, and my students. Woo hoo, Abba!! Let’s roll, Jamie! Bible is in the mail! Woot woot! So excited about this. Hubby and I were prompted to work on our finances just before this came up. I feel like this challenge is going to propel us in the right direction. So excited to see what God is going to do! Thank You Holy Spirit for leading me to this site. I found it while researching the “Sons of Issacar” and I have been reading for about two hours. So today I commit to the 2018 Abundance Challenge as I am believing God will bless me to free millions from debt mindset and this is my middle. God bless you Jamie. See you at the top! This is awesome Jamie!! I so want to do this. Our life, including our finances are a mess and have been for several years. ? I am going to share this with my husband, please pray that he agrees with me that we need to do this!! God Bless you sweet Jamie!